Helen in her charming and simple potting shed/green house where plants wait for their turn in the garden. Mary Jo was inspired by her recent visit to an exuberant garden in Ireland. World renown plantswoman, writer, lecturer and broadcaster Helen Dillon, and her Dublin garden, may seem a world away from the Australian experience but we learnt so much from our visit we just have to share with you. Helen uses colour in her plantings with confidence – blending textures and contrasting heights, and raising plants in the most unlikely containers ensuring maximum effect. A tussle of hot-hued summer flowers. Green house in the garden. The peaceful front entrance above, belies the liveleness of the garden beyond. Of course it should be obvious as good design follows universal principles, but originality comes in how these principles are applied. Common plants are used uncommonly; and the best containers do NOT have to be expensive. Canna-filled bins and meandering paths. Large bins provide plenty of growing space for tropical cannas and can be moved when the leaves die down. The garden is not all straight lines with visible focal points. Meandering pathways encourage us through the garden. While colour in the hardscape is muted – note the beautiful grey Irish limestone pavers around the reflection pond and the handcrafted stone walls which form the backdrop to the garden – Helen goes all out with colourful plantings. Colour is in the plantings not in the hardscape. A vibrant David Austin rose. Not all detail has to be complicated; single dahlias have a special charm. A formal perspective from the house. The central axis of the reflection pond, along with the side paths, is an easy to read hierarchy of order, but then Helen’s flair with plants and her colour sense completes the picture. This bench sits to the side of a widened pathway. Seating can be subtle, in neutral colours, and provide places of quietude. Helen’s garden is a carefully edited selection of the best in species. Dahlias are a highlight in her autumn garden; and the Verbena bonariensis, a common plant thriving in large, simple aluminium cans, is a long lasting highlight. An urn is the focal point along this secondary pathway. A profusion of summer’s colour. If you’re in Dublin make sure you visit Helen’s garden. She’s sure to give you a warm welcome. Although this appeals to lots of visitors, there’s something still very personal about Helen Dillon’s garden. You can tell it’s what she likes, not just what she thinks should be planted for visitor appeal. 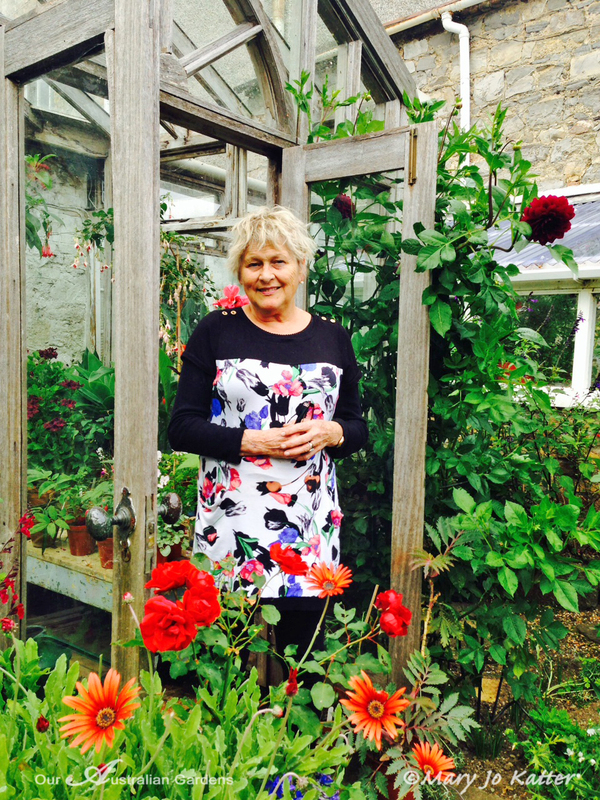 Helen Dillon is one of my favourite garden writers – and such a talented gardener, with aplomb. Who else would think of dustbins as planters.